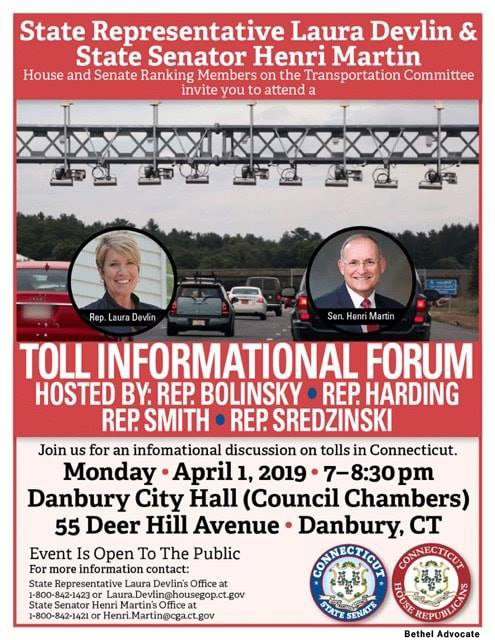 House and Senate ranking members on the Transportation Committee invite you to attend a Toll Informational Forum hosted by Rep. Bolinsky, Rep. Harding, Rep. Smith and Rep. Sredzinski. The informational discussion will take place on Monday, April 1. 2019, at 7-8:30pm in Danbury City Hall (Council Chambers), 55 Deer Hill Avenue, Danbury CT. Evevt is open to the public.